Dolphins are among the most intelligent, playful and resourceful members of the marine mammal family. Not only are they powerful swimmers, they are clever predators as well. Marine biologists have documented dolphin pods far out at sea circling schools of fish in a team effort to feed the entire pod. They also engage in a feeding phenomenon closer to shore called dolphin strand feeding. Dolphin strand feeding is a group effort by a pod of dolphins while hunting prey. It's named because the prey, usually mullet, is effectively stranded on an elevated shelf near the surface of the ocean and has no place to go. The fish got in that predicament in the first place because the dolphin pod, in a remarkably complicated and synergistic effort, has herded them onto this shelf so the dolphins can easily pick them off. Dolphins are effective communicators. 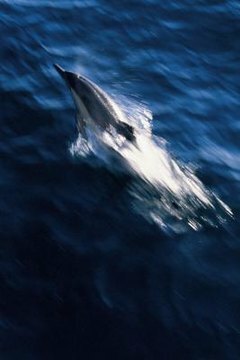 Humans have long been fascinated, a bit envious and bewitched by all the well-known skills dolphins possess such as lightning-fast speed in the water, delightful feats of leaping into the air and communicating with one another. To herd the targeted school of fish, the dolphins separate into teams of two to six dolphins. These teams herd the fish into a tight bond called a "bait ball." The other dolphins, at a pre-determined exact moment, create a wave by synchronizing vigorous body movements and pushing the water forward, forcing the bait ball towards the shore. The effort takes communication, speed, combined effort and skill. As the hapless, doomed fish flop around on the shore or sand bar, jump out of the water and work themselves into a frenzy, the dolphins set upon them, devouring them. Dolphins are usually solitary hunters, even when swimming together with the pod. So the very fact that dolphins use their impressive intelligence and echolocation communication skills to pull off this exquisite maneuver is an unusual and remarkable event. There are dangers associated with dolphin strand feeding, however. If the dolphins come too far ashore, don't catch the current on its way back out to sea or become stuck on the sand, they risk stranding themselves. This is a life-threatening problem, and even if they manage to save themselves, they risk sunburn and internal injuries. This behavior is not seen in all dolphins. A select number of pods engage in strand feeding regularly. The location must offer the ideal configuration of surf, shelf, sand bar and shoreline found, for instance, in the waters off the South Carolina and Georgia coasts. Other pods of dolphins have been spotted stranding feeding from time to time in the waters off Mexico and Portugal.